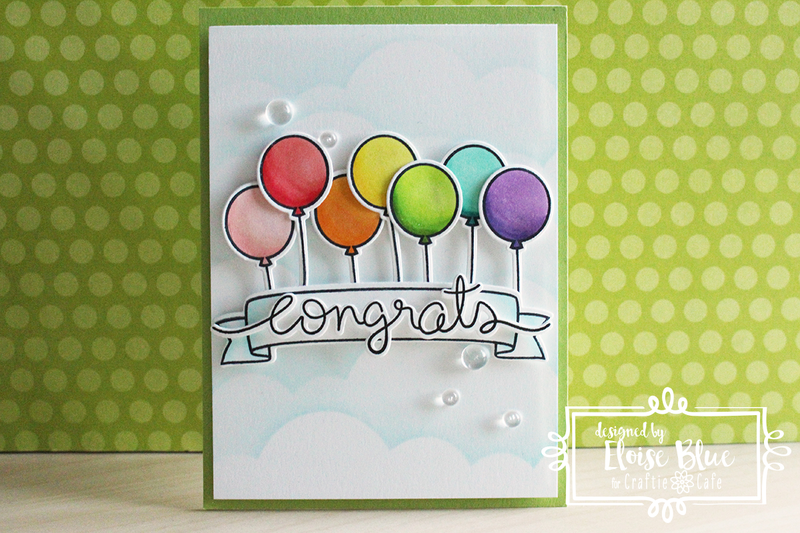 Hi everyone, today I’m back for Craftie Café with a congratulations card. I’m going to be using a ton of Lawn Fawn products for today’s card along with making my own stencil for a fun cloud background. To begin my card today I first cut a Puffy Cloud Border die from Lawn Fawn out of some acetate to create a stencil. I’m using some thick Judikins Acetate for my stencil so it can be used over and over again. Once my stencil was created I took a piece of white cardstock that I cut down to 3 ¾” x 5 1/8” and then used some Tumbled Glass Distress Ink to ink over each time, once one section was inked, I moved my cloud border up and repeated the process until my entire panel was coloured and looked like clouds. Next up I stamped all my balloons from the Party Animal set from Lawn Fawn and also a banner from Bannertastic and Congrats sentiment from Big Scripty Words. I then coloured in my balloons with Copic Markers, using all the colours of the rainbow on each balloon, since when I adhere them I want them to be in rainbow order. Once the balloons were coloured, I used some light blues to colour and shade the banner. I then used all the coordinating dies to cut them out. Once everything was cut I could assemble. I added some tape runner adhesive onto the back of the banner and adhered the balloons to the back of it. Then added foam adhesive behind all the pieces. I also added small strips of foam adhesive to the back of the congrats sentiment and adhered that on the banner too. 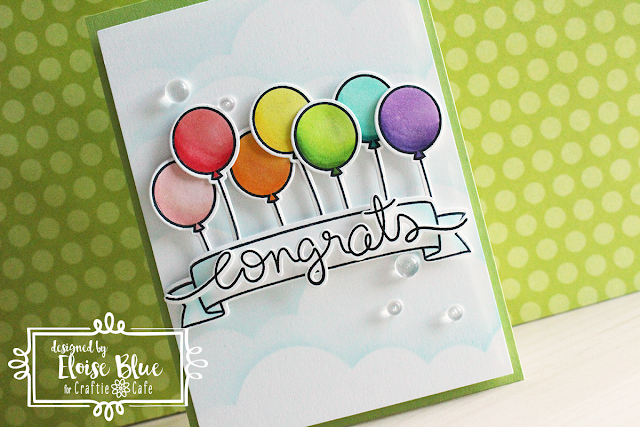 To finish it up I added some Wink of Stella onto the balloons and some clear droplets from Pretty Pink Posh around my scene and also adhered my panel to a green cardbase. I hope you enjoyed and got inspired and thanks so much for stopping by!